Just as Microsoft Dynamics 365 gives product suggestions, it also offers suggestions to supporting documents which can be instantly added to a sales presentation. With the option to seamlessly unify CRM and ERP capabilities, you can innovate quickly to further bring your company to the digital age. 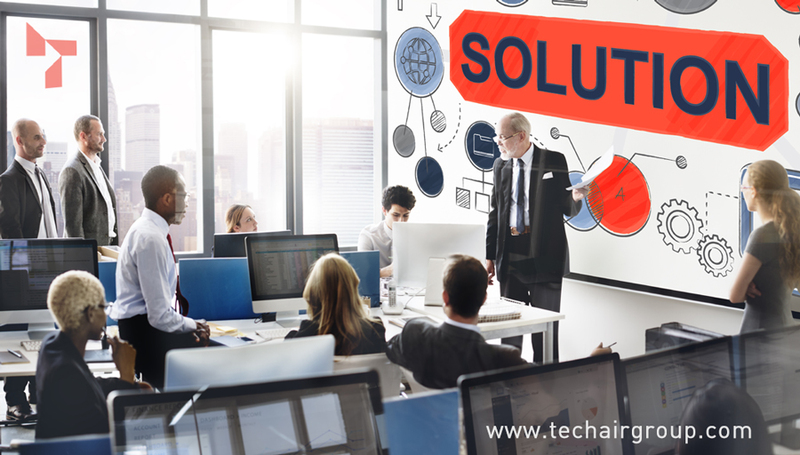 Read our top 5 reasons on why we at TechAir Group believe that Dynamics 365 is the best possible productivity tool for your organization. Increase your productivity, be more efficient, and sell anywhere with mobile implementation. This is just the start of how you will begin to sell smarter by using Dynamics 365. Time is often more valuable than money so increase the ROI of your team by reducing manual or duplicate entry by allowing them to make changes on their phone rather than returning to the office. Optimize how your customers interact and engage with emails to indicate to sellers when they should be more responsive and proactive. Smarter email marketing is made possible by having the ability to have automatic emails being sent out to up-sell, educate and convert customers. Integration with LinkedIn and buying signals from social media, authentic and personal engagement is brought to life. By focusing on the right customers the best route to reach each individual buyer will be showcased. Do this by engaging with likely prospects with predictive lead scoring. This personal content will engage customers with interactive presentations from PointDrive. Offer these prospects recommendations and insights with data from Dynamics 365, Office 365, and LinkedIn. Utilize the collaboration of these sites to scale your engagement and streamline your sales process by pilots sellers to the optimal outcome. All by offering insights and recommendations, Dynamics 365 pushes your sales team to reach their highest potential! Even the leaders of sales team benefit from guidance. When your team can follow a process to ensure they have taken all of the appropriate steps they can stay informed and be more productive with client. Give a powerful leverage to your sellers by keeping track of activities and communication with the Relationship Assistant in Dynamics 365. Watch this link to learn more about how these tools will help you connect with partners more efficiently and seamlessly. An adaptable platform is critical to save time for your sales team. A mobile Dynamics 365 is available for both phones and tablets. You are able to interact with all records even by working offline without the risk of losing data or connections with offline synchronization and offline drafts. This helps you keep track of what your customers want if you are at a baseball game or in a taxi. With Dynamics 365, you are able to engage with customers with any channel on any device. By using Artificial Intelligence, emerging societal trends, metrics, and operational data derived from your Customer service Organization. Give your sales team the right AI data so they are able make more informed decisions and curate better conversations with information extracted from past communications, notes, and more. Turn these insights into actions with targeted analysis by creating a competition for your team with Gamification by utilizing your Dynamics 365 system.